Hello dear readers, it has been a while since I’ve posted! I’ve been hip deep in various publication projects related to work, and they’ve drained much of whatever writing energies I’ve had this summer. But with another academic year about to begin, I’d be remiss if I didn’t write something to mark it. 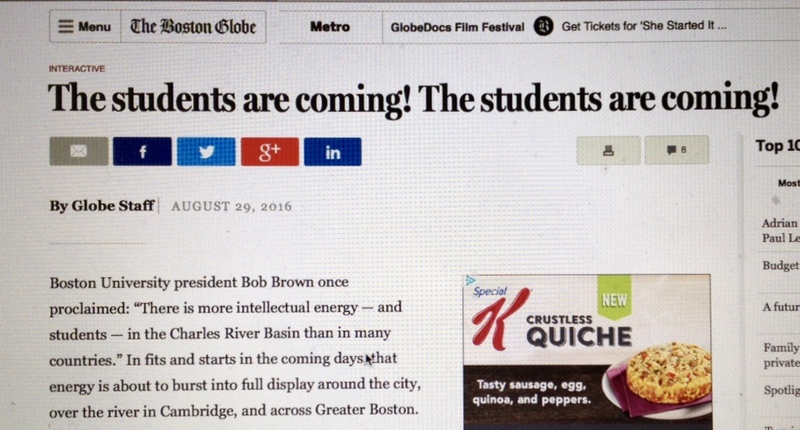 This late-summer ritual, the return of tens of thousands of college students to more than 50 area schools, replenishes Boston and infuses it with youth. The transformation is hard to miss. Boston traffic backs up and horns blare as families double-park to unload; the city’s shops and restaurants bustle with new activity; the Esplanade fills with joggers and bikers. Boston, the country’s ultimate college town, is back. The so-called “college experience” — that of going off to school, usually starting with a year (or three or four) of living in a residence hall — became a standard middle class aspiration during the last half of the 20th century. It holds this status today, too, even in the face of rising costs of higher education and a shaky economy. And so in college towns big and small, the students are returning in droves. For those of us who enjoy seasons, this is a harbinger of fall, which in New England is our best time of the year weather-wise. Among the pieces of advice I want to share with today’s college students is this: If you work on it and are fortunate, you can start building some lifelong friendships. Every five years, our Valparaiso University study abroad group holds a reunion to catch up with one another and to exchange increasingly exaggerated and dramatic stories from our semester together in England. Many of us manage to see each other on other occasions as well. We met in Chicago earlier this summer. Our gathering was a little smaller than usual because of a tangle of family and personal schedule conflicts, but we had a wonderful time nonetheless. A photo of most of this year’s attendees appears below. Sometimes it’s just the way things work out: A group of 20 or so people are tossed together for a term overseas, and many of the bonds created and strengthened during that time ripen into lasting friendships. True, the “college experience” should be about learning, growing, and preparing for the rest of life. And if it includes the forging of friendships that endure, well then, that’s an awesome thing indeed. This fall, I’ll be revisiting Valparaiso University when I return to campus for homecoming (35th year) and an extended stay to do some work on my writing projects. I’m fortunate to have a research sabbatical this semester, and so I arranged to do a “visiting scholar in residence” arrangement at VU, whereby I’ll be camping out in the library with my laptop and research materials for a few weeks. This also will give me another opportunity to connect with some of my VU classmates. I look forward to writing about this visit later this fall.